Lofoten’s natural resources have formed our way of life and local culinary traditions. A visit to Lofoten will not be complete without tasting the exciting fare that Lofoten has to offer, both summer and winter. In the summer you can try, for instance, salmon, saithe (coley), whalemeat or fresh prawns. You can either get these at a local restaurant or buy them at a local fish shop. 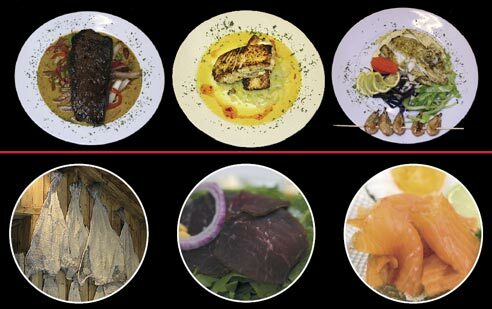 n Whalemeat is served in many different ways, primarily as steak, but it can also be used in many exotic dishes. Smoked whalemeat tastes good served with arugula salad, red onions, pine nuts and sour cream. n Smoked salmon is a Norwegian speciality that can be served in a number of different ways. n There are lots of blueberries, cowberries (mountain cranberry) and cloudberries in the Lofoten mountains. These are often used in a number of different desserts. The Lofoten Fishery is the world’s greatest cod fishery. It takes place from January to April and has always been then basis for human settlement in the archipelago. Every year, the cod come down from the Barents Sea to spawn along the North Norwegian coast, particularly in Lofoten where spawning conditions are ideal. n Stockfish is a unique natural product and Lofoten is one of the few places in the world where it is possible to produce it. The fish is gutted and hung out to dry in pairs on the innumerable fish racks found in Lofoten. The aroma of dried cod spreads across the entire archipelago, and they say "you can smell money" when the stockfish is on the racks. Most of it is exported to Italy. n "Mølje" – boiled cod, roes and liver. n Cod tongues are a delicacy in Lofoten. Dipped in flour, salt and pepper and fried in butter. n Klipfish is cod or saithe that is split, salted and dried. Klipfish is often used in different types of "bacalao", originally a dish from Portugal, where they make over 500 different varieties. You can try this dish at most restaurants in Lofoten. n "Boknafisk" is fish taken down from the drying racks before it is compltetely dried. Lofoten lamb is known all over Norway for its excellent quality. It has less fat and is meatier and more tender than lamb found elsewhere in the country. It also has a slight flavour of wild game. Local restaurants serve roast lamb, lamb chops, or lamb stew all year round. Christmas fare in Lofoten consists of pork ribs, salted and dried ribs of mutton and "lutefisk", which is cod that is soaked in lye and then watered down again. It is served with potatoes, bacon and mushy peas. Gull’s eggs are also on sale in local fish shops. They are delicious served with capelin roes and Norwegian caviar. Click here for some exciting attractions and holiday adventures. Click here for more information about the boroughs of Flakstad and Moskenes.